Looking for guidance on DLC? The game launched on August 13th. A demo is now available on Steam. Post-release game impressions begin on Page 4. Just ran the trailer on their Twitch TV channel. Code name "Project Truman." More info to come. Greater Emphasis on Personality via "Monarch Power"
Announcement trailer can be seen here. Some additional info from Kotaku. Hmm, less excited for this than I was for CK2, but I'll probably still end up sinking a huge chunk of my life. - Take your own decisions: Nation building is flexible: decide your own form of government, the structure of your society, trade politics and more. The possibilities are endless. - Use your Monarch Power: Experience the new system of monarch power where your spread of choices is influence by the caliber of the man you have at the top. Do you have a warrior King? Then it is time to make war. - Experience history coming to life: The great people and personalities of the past are on hand to support you. Thousands of historical events guide you, with unique different flavor depending on the country you play. Have more than a thousand historical leaders and over 4000 historical Monarchs at your disposal. - The world is now your playground: Players can enjoy over 300 years of gameplay in a lush topographic map in full 3D. Lead any one of more than 250 countries that originally existed during the game’s extensive time span. - Experience the all new trade system: The trade system adds a new dimension to the great trade empires of the period. Seize control of key ports to expand your trade, support it with your powerful fleet and the wealth of the world will flow to you. - Bring out your diplomatic skills: Deeper diplomatic gameplay, with coalitions, threats, fleet basing rights and detailed support for rebels. Introducing unilateral opinions, a country may dislike you, but you can be neutral towards them. - Engage in Multiplayer: Battle against your friends or try co-operative multiplayer mode that allows several players to work together to control a single nation for up to 32 players. Featuring hotjoin, improved chat, new matchmaking server andsupport for a standalone server. - Create your own history & customize your game: Europa Universalis IV gives you the chance to customize and mod practically anything your heart may desire. Aaaaaaand the ability to go from CKII to EUIV is likely to be announced at some point. It has to be. If not, it'll get modded in. Please, sir, where can I pre-order? I'd like to have another! Sorry, son. They got us. Very nice. Hopefully the new trade system will better emphasize the importance of a strong naval fleet and maybe even have some concept of a merchant marine. I'm really torn; EU3 is just so damn awesome, it's hard to think about what EU4 can do to be an improvement before a few expansions' worth of content. I have nothing to add other than my sincere personal excitement. In two brief hours, most of the planet was reduced to kittens. For some reason I don't feel as excited as I feel I should. I don't because I can probably get another 10 years out of EUIII. If they hadn't put out the last two expansions I'd be super excited. That said, I probably won't pick it up until the first expansion is done. Or until they confirm CKII to EUIV is a thing. Steam say 301 hours in EU3, but really I know that'd be more like 500 hours so maybe I feel like it'll just be more of the same, and I've already had a lot of that. For me, I never put a ton of time into the last two expansions. I played more of vanilla + Napoleon than the later stuff. You, however, went insane with the game. Hopefully they can change it up enough. Obviously, it's a long way off, but I'm still pretty jazzed about the announcement. I guess I sorta knew they were working on it, but it's nice to see them plant a flag in the ground. Even if that flag is a year away. I hear ya. But I hope they do what they always do and borrow ideas from previous games. I'm hoping EU4 is a higher level CK2, where countries are the personalities you have to deal with instead of people, you have to worry more about succession (EU3 did this some but not nearly enough), and they bring more combat control into the mix. More events, better control over the government, that all sounds great. I excited to see what they can do, given what they did with CK2. Hooray! With how many hours I've sunk into EU2, EU3, EU:Rome, CK2, etc, I'm really looking forward to this. I may need to look into setting aside a couple vacation days so I can keep my job when it comes out. Nice early preview courtesy of Rock, Paper, Shotgun. So, after watching that video, I have two questions. 1. What was the deal with the goblin just before the 3 minute mark? 2. Is Paradox usually pretty realistic with release dates? With some companies, Q3 2013 means Q3 2013. With others it often means Q3 or Q4. With a few others, it actually means we MIGHT see it by the end of 2014 if things go well. (b) It will be in a finished state by Q4 2013. 1. I think it is a subliminal ad for Impire. 2. They are pretty good about hitting their dates. Sometimes to the detriment of the thing being released. :\ Although, I will say, the last couple of Paradox Studios-developed releases have been in good shape. Well, it looks like that worked. Your reply with the name and a quick google search led me to the Impire thread here and videos about the game. I had no idea they were taking a stab at a Dungeon Keeper like game. It looks like something else I'll need to add to my radar. Thanks for the responses guys. Second dev diary is up on the Paradox forums. Interesting look at the features/systems from EU3 that they are removing for EU4. Well, a revamped trade system is a welcome change, but removing the domestic sliders. Wow! Can't wait to see what they've come up with. Well, I've spent much of my free time the past few days reading the 18 EU4 dev diaries and accompanying threads up to this point. I really like what they've presented so far. In particular, the way the new trade system, naval power, and colonization look like they will all work together has me pretty excited. The change to a CK2 type of relationship system also looks like a nice addition to diplomacy. What does everyone else think so far? Great Rob Zacny preview over at GameSpy. He spends some time with the game and comes away very impressed. Ick. Paradox are doing one of those recruiting campaigns. Of course they're also giving away DLC and ... your name in the credits. Damn them! Europa Universalis IV: Winged Hussars Unit Pack DLC contains 12 unique cavalry models for the cavalry for Russia, Poland and Lithuania, three of the most influential eastern European states in the Europa Universalis IV era. Having problems subduing your neighbors? Do your “loyal” subjects try to overthrow you every chance they get? Want to know how contemporaries dealt with the problems? The Prince by Niccolò Machiavelli remains a staple of the Western literary canon, and one of the most influential political texts ever written. With a personal introduction by Johan Andersson, the studio manager at Paradox Development Studio, this book will let you learn from the master how to plot, threaten and fight your way to greatness. It is better to be feared than to be loved. The shortest road to greatness is through marching armies. Learn from one of the greatest strategic thinkers in history as you battle your enemy to submission. Though thousands of years old, Sun Tzu’s masterpiece stills teaches wisdoms to those that pick it up and understand its wisdom. With an introduction by Thomas Johansson, the Europa Universalis IV project lead at Paradox Development Studio. This is the perfect helper for those that equate glory with warfare, and a necessary tool for those who need to defend themselves against the former. But remember that the wisest man know how to win without fighting at all. Dominate the world with skill and knowledge through this strategy guide, made by the developers themselves. And, true to the game itself, it does not only teach you all the tricks of the trade, but also doles out some lessons about historical strategic thinking and how the gameplay connects to modern doctrines. Become the ultimate fighter AND scholar with this unique strategy guide. Europa Universalis IV: National Monuments DLC adds new graphical national monuments to the already stunning Europa Universalis IV map. The new map items are: The Cologne Cathedral, The Notre Dame cathedral, The Tower of London, The Old Faithful geyser, The Kremlin, Saint Peters Cathedral, Mount Fuji and the temple Angkor Wat. 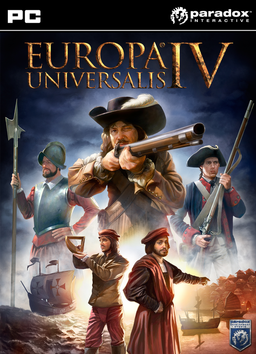 Europa Universalis III: Chronicles includes the award-winning epic strategy game where players take control of a nation and guide it through the ages to become a dominant global empire.